Get the exercise you desire, without having to leave your everyday chair. 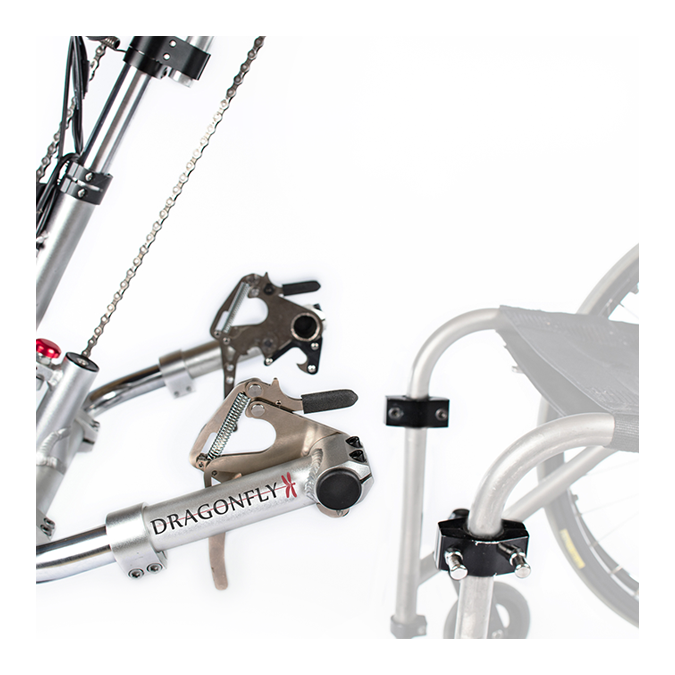 By attaching the Dragonfly to your chair, you can utilize the handcycle to propel you forward, saving your shoulders from wear and tear brought on by constant pushing. 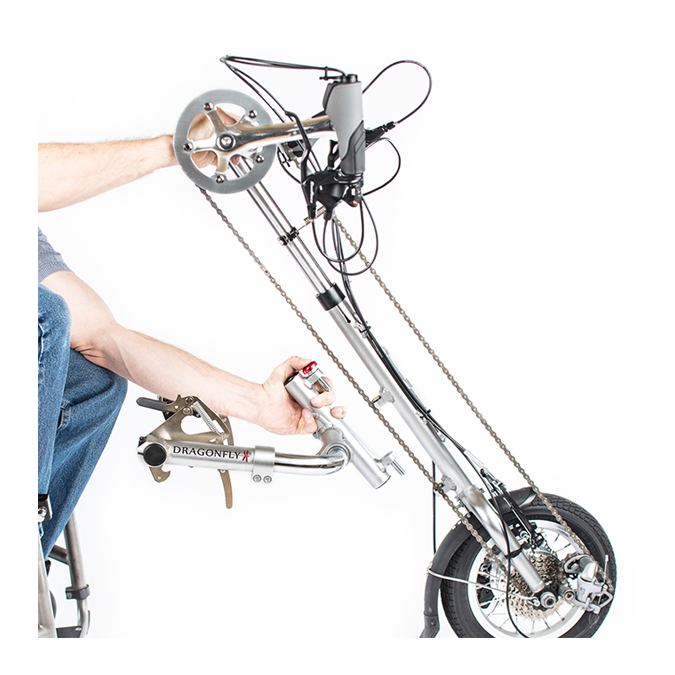 Just wheel up to the Dragonfly, lift it by the handles, and attach to the wheelchair. It lifts the casters and sets the position. 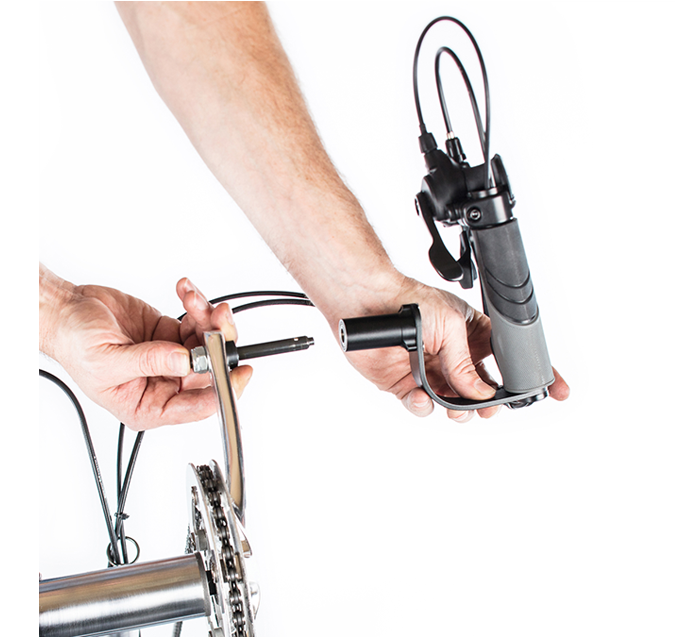 Fingertip controls are right where you can reach, and easy to use. Simple push of the finger taps the gears into place. Excellent stopping and shifting...smooth and easy. Very simple to take off your wheelchair, and pop into a trunk or rest against a wall until next time. Anyone can put this together. 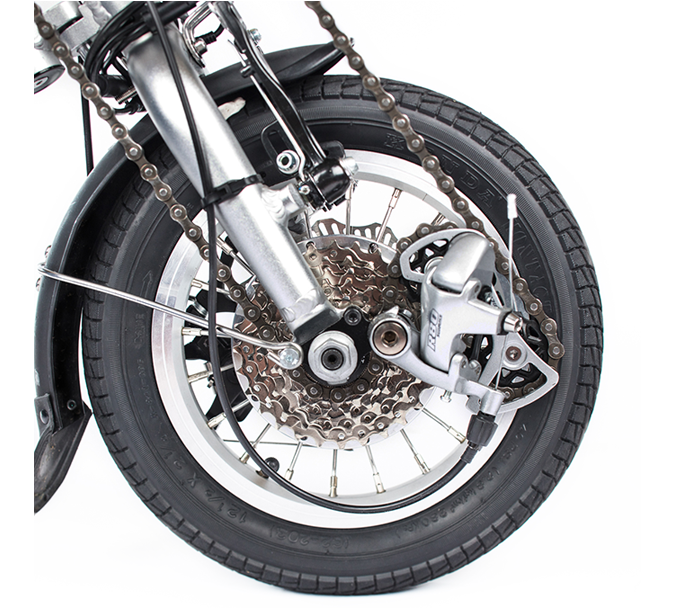 Does not require specific mechanical skills. Makes for a convenient smaller package if handles are removed. We want to inform our customers that after this date all units will have a couple of design and look changes which are all improvements to the original design. After the new design has been on the market for over a year now these are the slight improvements. 1. 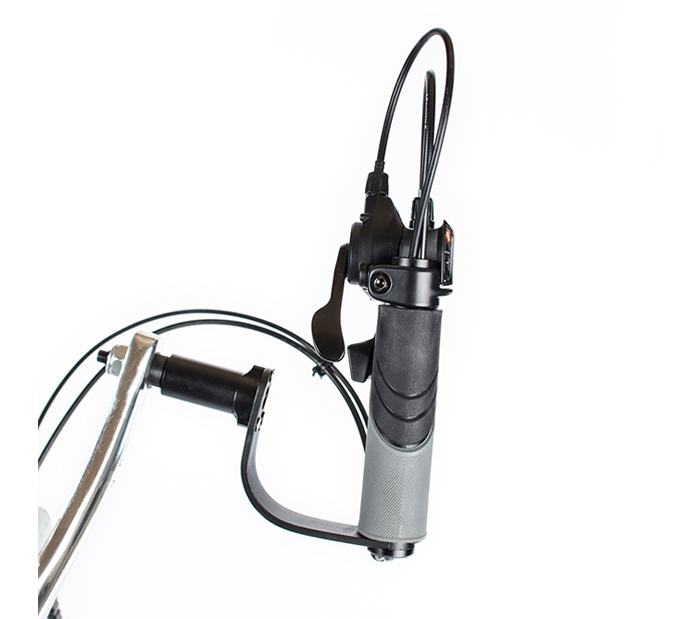 The quick release button for the attachment arms is no longer red and big button. It was getting damaged in situations where customers are hard on the unit. So it is now a silver metal small button which is stronger to rough treatment. 2. The arms of the attachment are no longer round elbows they are squared off by having tubing welded and meeting another section of tubing. 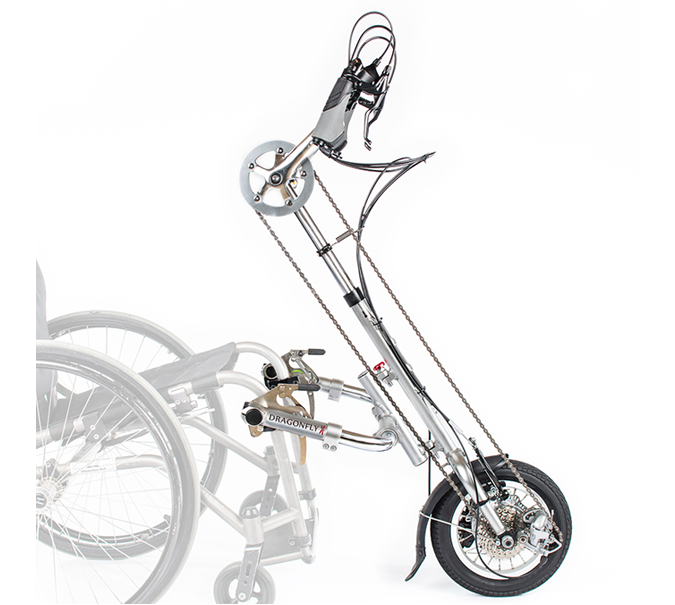 this allows for many more wheelchair types and especially narrow sizes to mount easily to the unit. This is very nice for kids wheelchairs which are very narrow. 3. Lastly the units going out right now do not have the logo. When I wanted to go handcycling, I had to rent something and then it was a big effort to move from my wheelchair to the hand cycle...and each time it would be a different handcycle with a different set up...always time-consuming and awkward. With the Dragonfly attachment, I never have to leave my own setup in my chair, i can easily snap it on, and go whenever I want. That is the key...WHENEVER i want!! I love owning this product. It has given me freedom and made my life so much more active. I can join my friends who are on bikes, or rollerblades, or who jog....or who have their own handcycles...and the most fun times are when I join my friends who have Fireflys of their own....we have a great outing. You should get one of these...they will enrich your life!!! 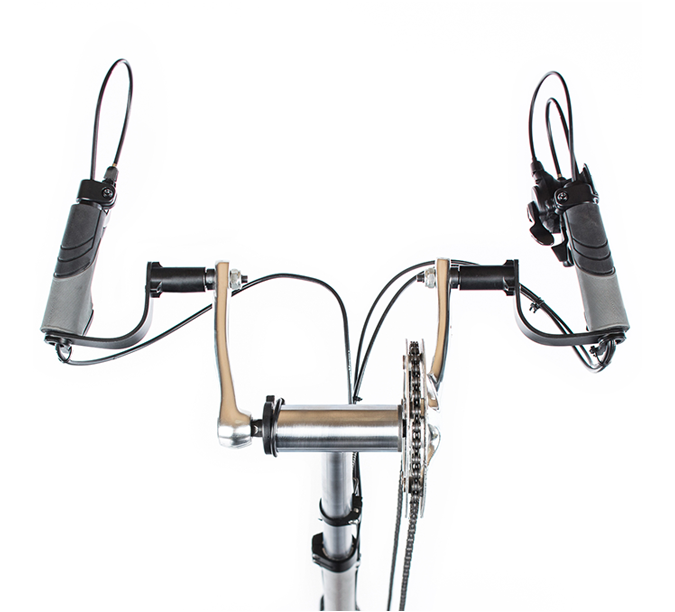 This handcycle has helped me lose weight and stay active which can be really difficult when you're in a chair. The best part is that it's really simple to use and has multiple gears for different work-out intensities and I really enjoy the ability to lower the gear and just go for a light cruise. Love the fact that I have a reason to get out more. Would definitely recommend to anyone trying to get more exercise or just get out more.